Ever feel like you’re in the middle of a strategy sandwich? Boy, that peanut butter is hard to get off. In many organizations, it’s true that mid-level managers are required to execute strategies they have had little input on. Is this frustrating? Hell yes! What we need to realize though, is that managers in this position are still responsible for their strategies–the ones they are intentionally or unintentionally practicing based on how they allocate their resources (time, talent and budget). 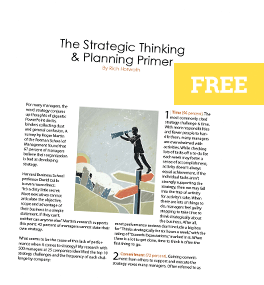 While you may not have control over “strategy from the top,” you certainly have a say in your strategy, whether it’s formally acknowledged or not. Instead of constantly pushing back on the bread, find the areas where you can leverage your strategy with the others and spread it on thick. How have you handled being in the middle of the strategy sandwich? Speak up or forever hold your mustard.